With this type of bump, a picture is worth a thousand words in describing appearance. If your eye looks like this, you have a pterygium. 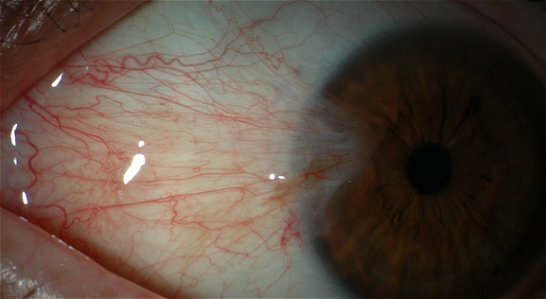 And if you have a pterygium, likely you have noticed it and already asked for advice on what it is--a pterygium is hard to miss, even in its early stages! It looks like a mass of blood vessels growing onto the surface of the eye, almost like the white of your eye is overtaking the clear corneal tissue. They can be large or they can be small and non-progressive, but they are very challenging to remove once they begin to form. 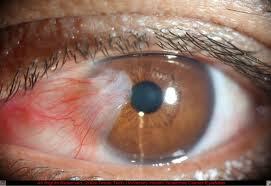 A pterygium is similar to a callous in concept; it usually results from chronic irritation, dryness, and UV exposure. No surprise, pterygia are more common in equatorial countries, or people that spend most of their days outdoors (I often see them in construction workers). Sun and wind damage can turn the conjunctiva (the vascular tissue overlying the white of the eye) into a thickened growth, often progressing over the corneal tissue. Typically if you remove the irritant (sun and wind exposure) by wearing sunglasses and using frequent artificial tears, the pterygium stops progressing. Unfortunately these treatments won't reverse the growth that already occurred. Pterygia can grow so aggressively over the cornea that they begin distorting vision and inducing a lot of astigmatism. If this is occurring, your doctor is going to recommend a surgical procedure to reduce the pulling on the cornea. Surgery for pretygia is difficult; your surgeon must protect the delicate cornea underneath to prevent permanent vision loss with scarring. And pterygia can grow back after removal because the conjunctival tissue has changed in that area with a callous-like growth pattern. Your doctor will discuss your options with you to determine you best treatment plan. I'm glad you found the information you were looking for! 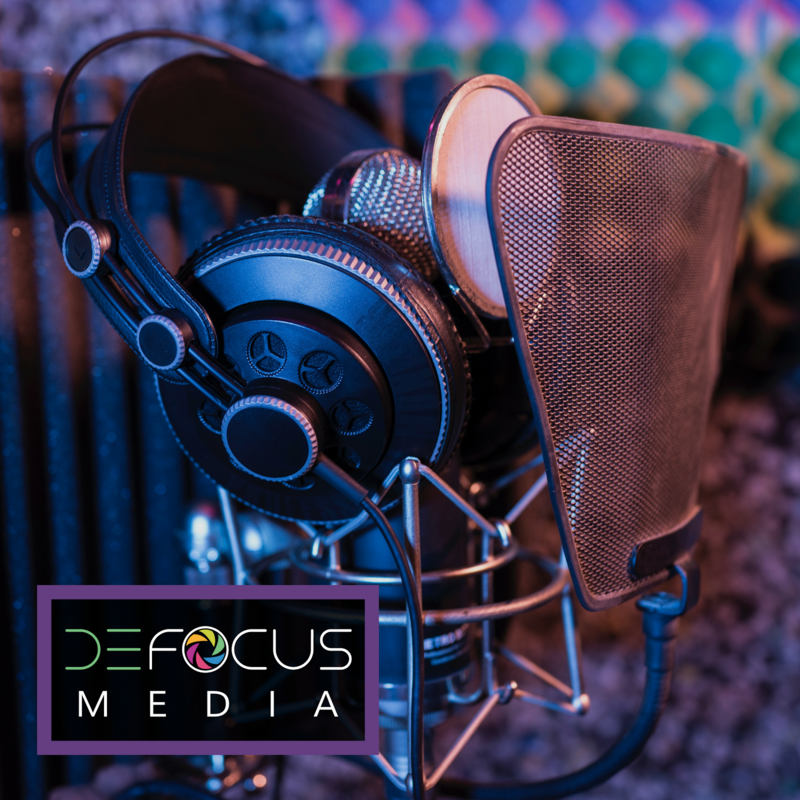 If you have specific topics that you would like me to cover in another post please feel free to email me with suggestions!